Sarcopenia, an under-recognized involuntary age-related loss of muscle mass, strength and function, largely contributes to frailty, functional impairment and a decreased capacity for independent living in older adults. 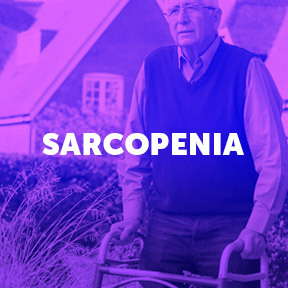 Sarcopenia can increase the risk of falls and fractures, and impact the ability to perform everyday activities, such as walking, rising from a chair, lifting objects or climbing stairs. Development of sarcopenia is multi-factorial, occurring over a long period of time, yet the biology of sarcopenia remains elusive. While aging and physical inactivity are key factors in sarcopenia development, other contributing factors include age-related changes in the neuromuscular system, decreased hormone levels, neurological decline, decreased protein synthesis, chronic illness, inflammation and poor nutrition. Sarcopenia, which may begin as early as age 40, is a gradual and continuous process with muscle mass loss averaging one to two percent yearly past the age of 50 years. Assuming that muscle loss rates are similar among adults, those with greater muscle mass will have a higher reserve capacity for muscle loss before physical frailty compromises function. With aging, changes in body composition generally result in one pound of fat and fibrous tissue gained and one half pound of muscle lost annually between the ages of 30 and 50. Data demonstrates that this shift in body composition occurs even when overall body weight remains relatively stable. The gain of body fat along with the loss of muscle mass is seen not only in sedentary people but in active older adults as well. However, fitness and functional reserves remain greater in those who exercise regularly as compared to those who are inactive. Loss of reserve capacity results in an increased sense of effort for any given form of exercise, which may discourage older individuals from physical activity. However, exercise at every age is beneficial and will help decrease body fat, improve oxygen consumption and increase muscle strength. With continued lack of physical activity, cardiovascular function decreases, and maximal oxygen intake diminishes as sarcopenia advances. While inactivity, unbalanced diet, inflammation and chronic stress all contribute to sarcopenia, the condition can be slowed and some of the strength that has already been lost can be restored. Appropriate level resistance training using free weights, resistance bands or machines, along with adequate nutrients can help to safely and effectively strengthen muscles, as well as enhance bone density. Protein, in particular, acts synergistically with strength training to increase muscle mass and improve muscle protein balance. Protein foods, such as dairy, soybeans, peanuts, meats and eggs, are naturally rich in leucine, one of the amino acids most essential for muscle health and proper metabolism. Leucine stimulates protein synthesis in muscle tissue, contributes to the growth and repair of muscle and bone tissue, and inhibits the breakdown of muscle proteins after trauma or severe stress. In addition to proper nutrition and adequate exercise, taking certain supplements may help to decrease development risk, delay or improve the condition. A recent study published in the journal PLOS ONE involving two groups of men aged 70 and older, found that the combination of a 12-week progressive resistance and high intensity interval training program, along with certain nutrients, whey protein, creatine, vitamin D, calcium and fish oil, resulted in improvements in deteriorating muscle health and overall strength, as compared with the participants taking placebos. The research supported by the Labarge Optimal Aging Initiative within the McMaster Institute for Research on Aging concluded that twice weekly training enhanced by supplementation greatly improved the physical strength and health profile of the participating senior citizens. For those who don’t exercise, today is a good day to start, as it’s much easier to prevent or slow the progression of muscle loss than it is to reverse it. While aerobic exercise is great for cardiovascular fitness and weight maintenance, it is only mildly effective for preserving lean body mass. To increase lean muscle mass, resistance training is preferred. In addition to building muscle, strength training can promote mobility and improve health-related fitness. A sarcopenia-prevention regimen of dietary modifications, nutritional supplements and some form of resistance training can improve lean muscle mass, and optimize muscle strength, functionality and overall wellbeing, even at an advanced age. While millions of people become weak and frail as they age, the good news is that you don’t have to be one of them. Free Form Amino Acids by Douglas Laboratories®: This product supplies a nutritionally balanced blend of essential, conditionally essential and important non-essential amino acids in support of protein metabolism, as well as hormone and neurotransmitter synthesis. Free of gluten, dairy, soy, yeast, sugar, preservatives and artificial ingredients. PureLean® Whey by Pure Encapsulations: Each serving of PureLean® Whey supplies 21 grams of highly purified, cold-processed undenatured whey protein sourced from grass-fed cows. Whey protein supports overall wellness with high quality protein nutrition, provides support for healthy muscle function and recovery, and promotes healthy weight management. Natural vanilla bean flavor. Gluten free, Non-GMO formulation. Whey Cool™ Natural Chocolate Flavor by Designs for Health®: This full-range, biologically active, non-denatured whey protein concentrate provides high quality protein and a full complement of amino acids, as well as lactoferrin and immunoglobulins. Sourced from grass fed cows. Free of hormones, antibiotics, gluten, wheat, preservatives and artificial ingredients. Non-GMO formulation. Klean Isolate™ Natural Vanilla by Klean Athlete®: This NSF Certified for Sport® whey protein isolate supplies essential amino acids, as well as branched chain amino acids in support of daily dietary protein requirements and optimum health. Free of yeast, wheat, gluten, soy, corn, starch, artificial ingredients and preservatives. Non-GMO formulation. Klean Creatine™ by Klean Athlete®: This NSF Certified product supplies pure creatine in support of muscle strength, performance and recovery. Creatine may significantly benefit increased muscle mass and improved performance in high intensity and resistance training. Free of wheat, gluten, milk/dairy, soy, artificial ingredients and preservatives. Non-GMO formulation. Creatine Powder by Pure Encapsulations®: Creatine provides safe nutritional support for optimal performance during weight training, sprinting or short-duration, high-intensity workouts. Gluten and soy free, Non-GMO vegetarian formulation.